If you are willing to buy a home in Pune, you can have a look at Ajmera Exotica. The exotic residential complex has been developed in recent years, with elegantly designed apartments for the homeowners. You can buy 1 and 2 BHK apartments in the estate and enjoy the luxury. The apartments are spacious and you will love the ambience in the residential complex. The prices of these apartments range between INR 24.78 lakhs and INR 54.21 lakhs. Properties in Pune are in high demand due to the increasing commercial importance of the city. The residents can get an easy approach to the important places in the city from the estate. 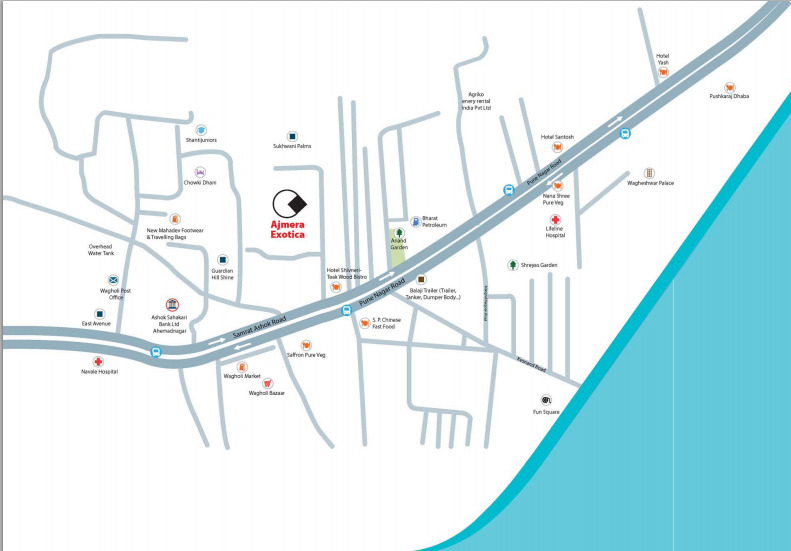 The central location of the residential complex ensures a seamless access to all the important places around. The commercial zones are located close to the homes. The Ajmera Exotica price is likely to rise in the coming years, with increasing demand for quality homes in the estate. Investors from various parts of the country are interested in buying these apartments. For homeowners, this is the right time to make the investment. The apartments are elegantly designed and come with sophisticated furnishings. The residents will enjoy a wide range of luxury amenities in the complex. Particularly, health enthusiasts and fitness freaks will enjoy a good time in the complex. The estate comes with a senior citizen’s zone, seating Gazebo Alcove, yoga platform and walking track. If you are fond of green living facilities, you will enjoy the beautifully landscaped gardens in the complex. You can have a stroll in the walkways along the garden, or enjoy your time in the seating area. The residential complex also comes with rainwater harvesting facilities. The social infrastructure in Pune is well-developed. The residents can enjoy the seamless transportation facilities to the commercial zones in the city. A number of blue-chip companies are coming up in Pune. The IT infrastructure of the city is also developing fast. Therefore, the residents can enjoy the immense exposure to the employment opportunities in the city. This is one of the reasons behind the high demand for the apartments in the residential complex. The places of entertainment are located close to the residential complex. Several shopping malls and multiplexes are located close to the city. The residents will also enjoy a fast access to the various social institutes in the area. The important schools in Pune include Victorious Kidss Educares, Air Force School, The Orbis School, Air Force School, St. Arnold's Central School, Symbiosis International School, and Pawar Public School. The important hospitals in the area include Niramay Hospital, Imax Multispeciality Hospital, Sushrusha Hospital, Balaji Hospital, K K Hospital, Kohakade Hospital, Salunke Hospital, and Columbia Asia Hospital. The residential complex brings a wide range of lifestyle and healthcare amenities to the residents. These residents can enjoy the swimming pool, gym, clubhouse, and various indoor and outdoor games in the complex. If you are willing to buy a property in Ajmera Exotica Pune, you can get these apartments now. Enjoy the luxury and comfort in the elegant apartments in Pune. Vehicle free walkway & senior citizen’s area at podium level.